Good morning! I just couldn't resist the trio of Angel Emmas by C.C. Designs. I went with the digital images this time. This is one of them, sweet Emma with her horn. I made this for a couple of challenges. Firstly, I used Karen's Sweet Sunday Sketch #41 for my layout. This is also for the JUGS4 challenge to add a 3-D flower to your project. The double layer crochet flower is one made by my SIL, Mary. I added pearls as a finishing touch to the card. Accessories: Rectangle and Scalloped Rectangle Nestabilities (Spellbinders), Scalloped corner rounder (Marvy), Markers (Copic), Pearls (Basic Grey), Star Dust and Gold Stickles (Ranger), Crochet flower, Foam tape. Beautiful!! Love the Angel Emma! Such a gorgeous card! I love those pearls. Stephanie, Your card is very pretty & your 3-D crocheted fleurette adds such a nice touch accompanied with the pearly center! Thanks for playing along with Just Us Girls. I hope to see more of your creations in all the upcoming challenges! Oh Stephanie...your work is so gorgeous!! Each week when I see your card, I do a double take to make a mental note of the fab stamper I've come across...and it's you! 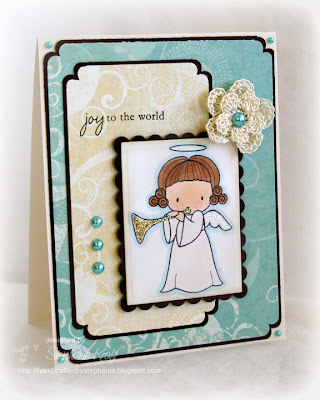 Thank you for sharing your beautiful creations :O) Your sweet, sparkly angel and the layout with the black, contrasting layers, are perfect! They really make your card pop!! Thanks so much for playing along with Just Us Girls this week! Hope to see you on Saturday for a fun Wild Card challenge I'm hosting! You don't want to miss it...EVERY participant will be a winner! !